One of the most peculiar things about the W&D/Hickory Valley Railroad is that it was organized as a common carrier 'official' railroad. But why do this for a logging railroad only two miles away from the PRR at West Hickory? This was for two reasons. First, this allowed Wheelers wholly-owned railroad - the Hickory Valley - to be the "originating" freight carrier for outbound lumber. Under the Interstate Commerce Commission rules of the time, this allowed them to get a much higher share of the freight charges. In essence, Wheeler got a portion of the freight bill refunded from the Pennsylvania Railroad, and they couldn't do a thing about it..
Second, W&D built over the hill to Ross Run, and organized this as the Hickory Valley Railroad to connect over to the Tionesta Creek valley - and Wheeler's competitor, T.D. "Teddy" Collins. Collins had no way to ship lumber out of his mills except over the "common carrier" Hickory Valley Railroad, owned by his competitor, who set the tariff rates! This situation lasted until 1900, when Collins built his own 'common carrier' railroad - the Sheffield and Tionesta - all the way up to Sheffield to get around the Wheelers and their 'excessive freight rates'. 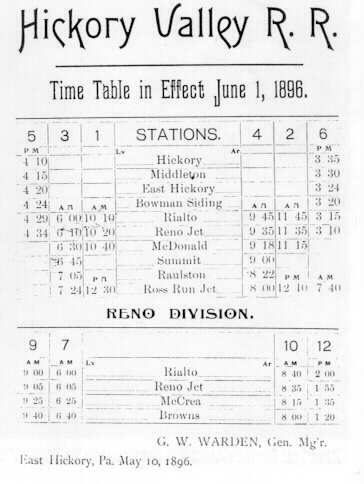 But, as an "Official Railroad", they were obliged to publish a public timetable. This 1896 timetable is a mystery, because at that time, W&D only owned two small Shays with a top speed of maybe 10 mph, and no company records or photos have ever shown any passenger cars. But, in theory , you could arrive at West Hickory on a Pennsylvania Railroad Pullman, and have a scheduled train waiting on the HVRR, though you may have had to ride in an empty boxcar. On a personal note - my Grandmother recalled that Wheeler regularly commandeered boxcars, loaded hay bales into them for seats - and ran Sunday passenger specials to West Hickory for church revivals, circuses, etc. Although it wasn't very big, you could still find the HVRR listing in the Official Guide. The 'puzzle' here is that even in the 1900 listing passenger service wasn't mentioned, and this is before the Sheffield and Tionesta was finished, and the Ross Run line was still operated.